Welcome to your very special crochet catnip mouse tutorial! 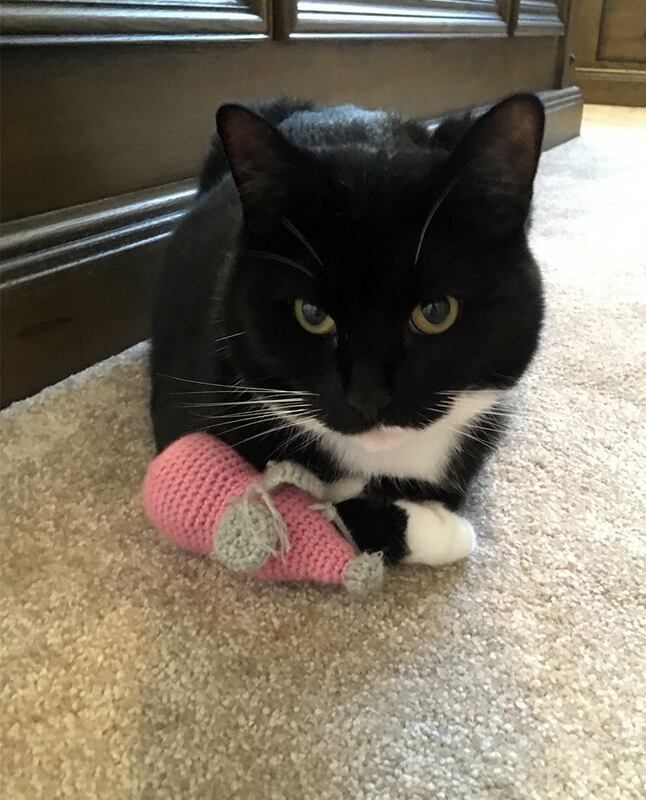 Helping you to make your very own super fun kitty toy using a simple catnip mouse pattern. Whether you are a crochet master or completely new to the craft, you’ll have no trouble following along. And your cat will be very happy with the end result. 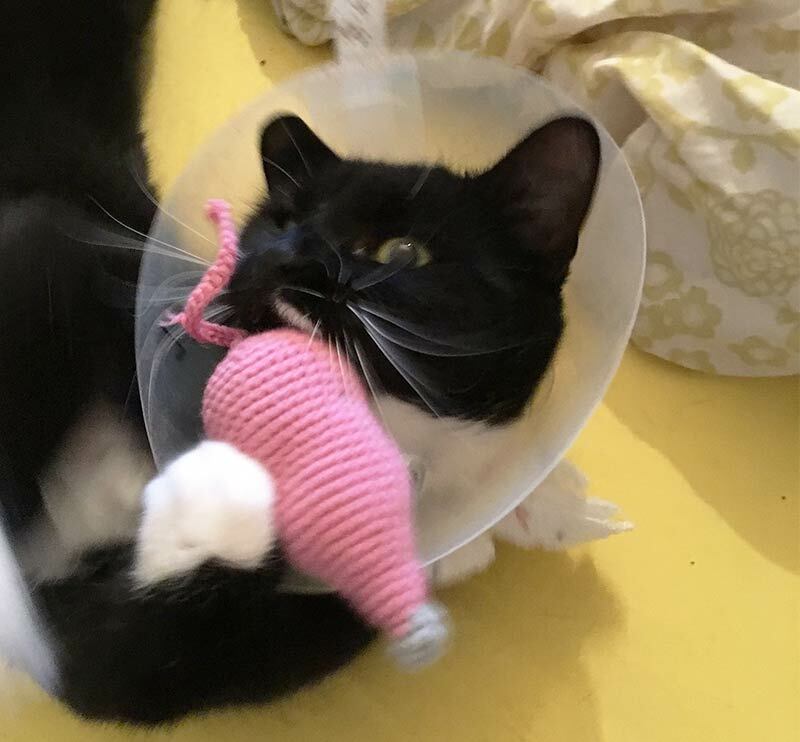 Before we begin, let’s take a quick look at catnip toys in general and why I’ve been crocheting them for my cat. Is your kitty a fan of catnip? Most cats are, and my little boy is no exception. 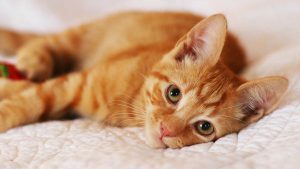 Catnip is a herd which triggers a happy response in our feline friends. Some cats like to lick it, sniff it and chew it. Others will turn lively or energetic around it. And it’s all because the smell triggers a chemical reaction in their brains. But don’t worry, it’s not harmful and although it doesn’t have any health benefits it doesn’t do any damage either. And it’s very fun for the 75% of cats who enjoy it. Oscar is my five year old tuxedo cat. His favourite things are hunting, food, hugs and catnip. Probably in that order! But he’s not been having the most fun time recently, because he managed to get himself injured. Here’s the lovely lad looking particular sorry for himself. 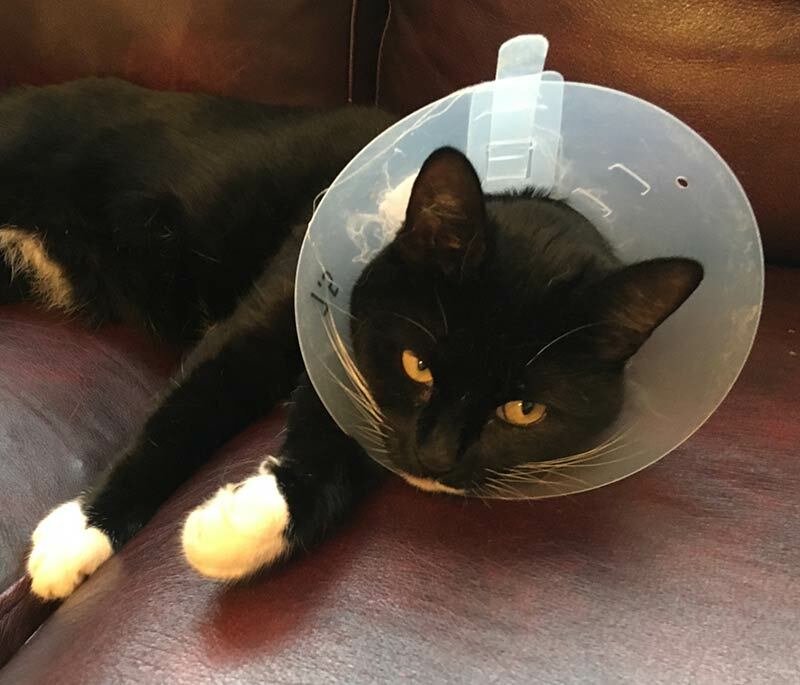 Cat cones are no fun, especially not for kitties who like Oscar are lucky enough to normally spend a lot of their time outdoors. Here in the UK it’s a lot more common to let your cats outdoors than it is to keep them in. 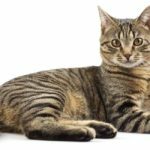 But in the US indoor cats are much more common, and those of you with purebred cats in the UK or who live in cities almost certainly keep your kitties indoors too. 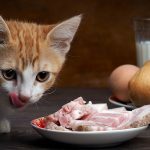 There are arguments for both sides of this, and you can read them all in this article on Indoor Cats vs Outdoor Cats. 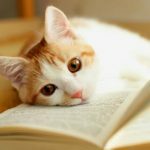 But whichever side of the fence you and your cat fall on, cat toys will always play a role in keeping your kitty happy and the bond between you strong. 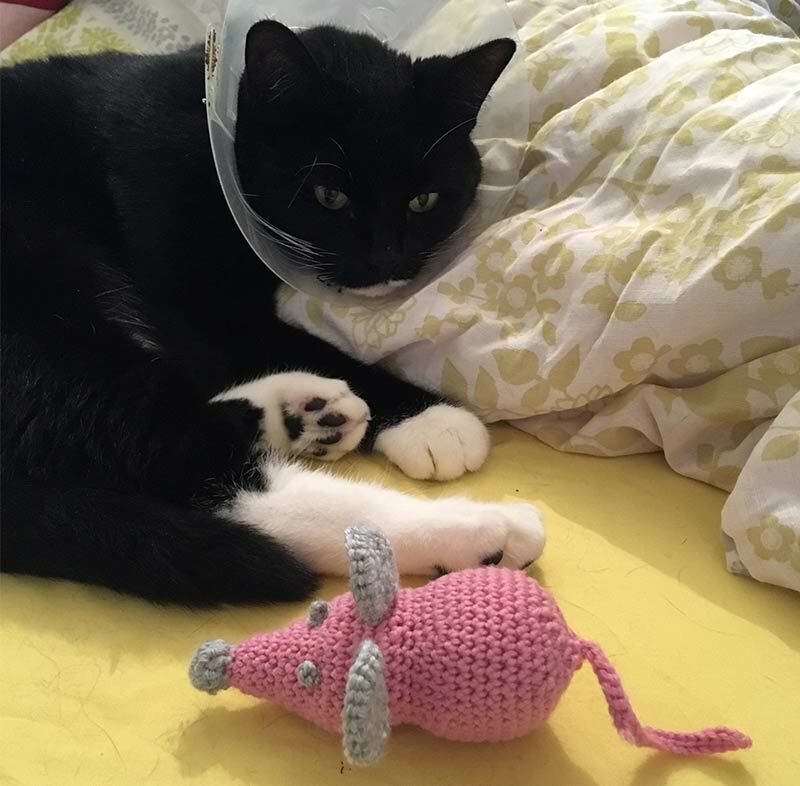 Why A Crochet Catnip Mouse? If you have an outdoor cat play is still of course a benefit. 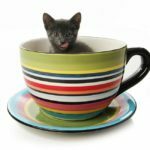 If you have an indoor cat you will probably be even more keen on having a range of indoor cat toys to keep them happy and entertained. But a coned cat who normally prowls the neighbourhood? Well, I’ve discovered that’s something else entirely. And was a problem that needed fixing sharpish. When Oscar hurt himself he was miserable. 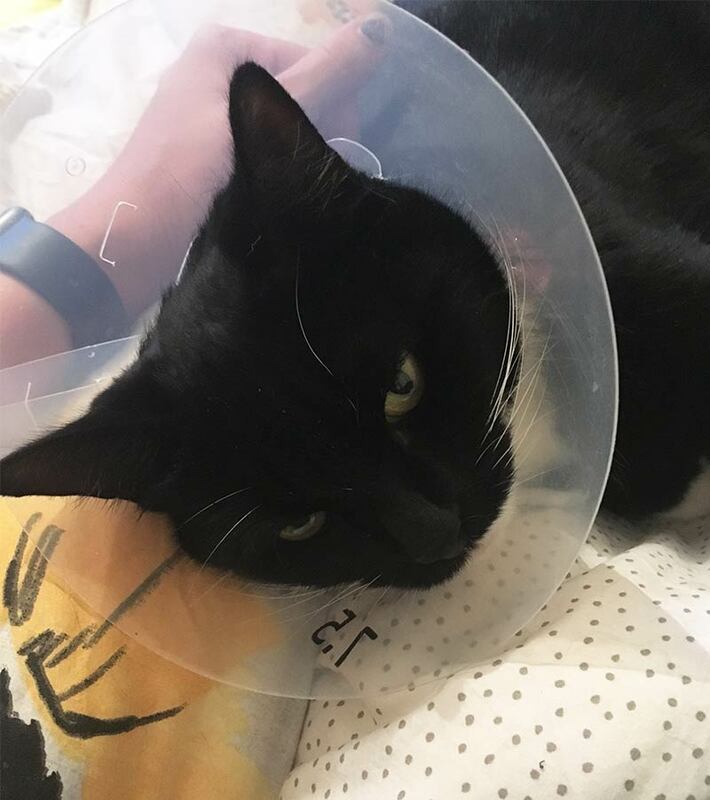 His cone wouldn’t fit in his favourite hiding places, the cat door was locked and he was very uncomfortable. For the first couple of days he was very clingy and got by on sleep, hugs and extra snacks! But then he started to feel better and the boredom set in. Now he’s got a fair few toys anyway, with a real preference for toy mice and balls. I started to think about how else to keep him entertained. 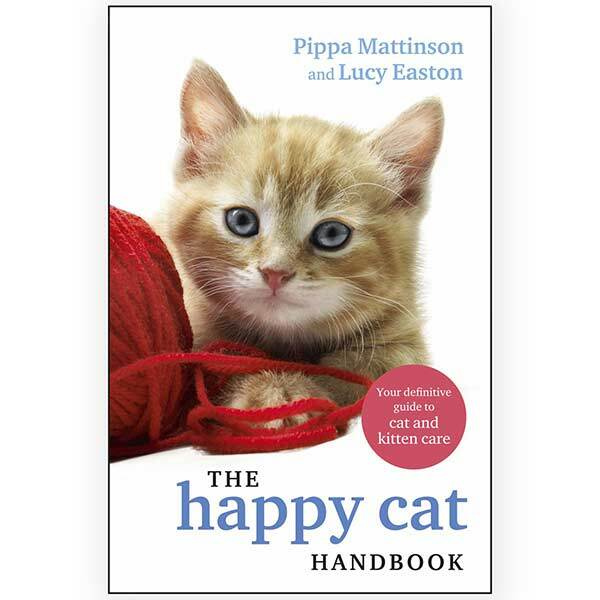 When I remembered a chat I’d had with The Happy Cat Site’s lovely Cat Behaviorist, Clare Hemington. 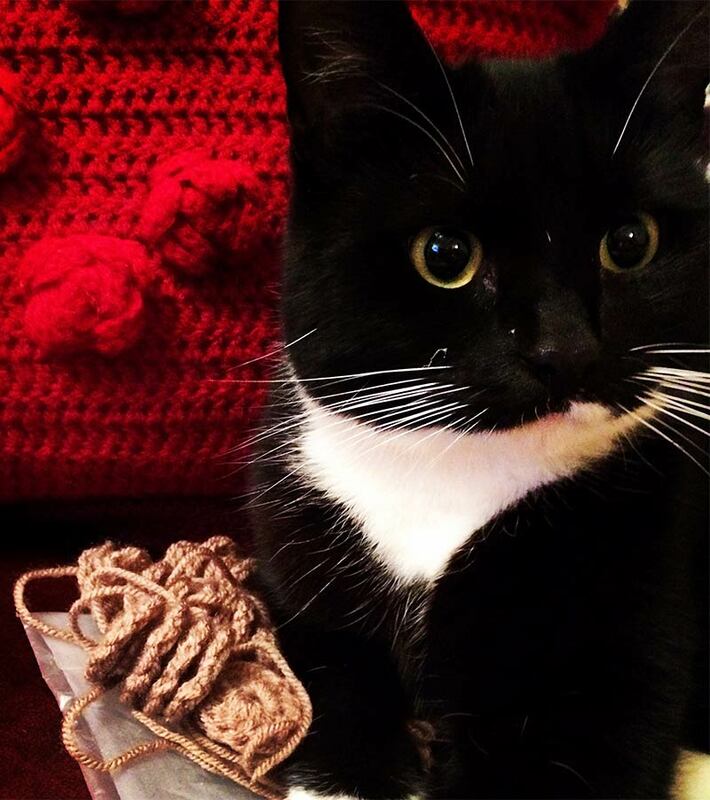 She’d seen my crochet site a few weeks ago and suggested I could crochet Oscar a catnip mouse! A great idea and the timing couldn’t be better. So I settled down to make one for him. And – spoiler alert – he loved it. 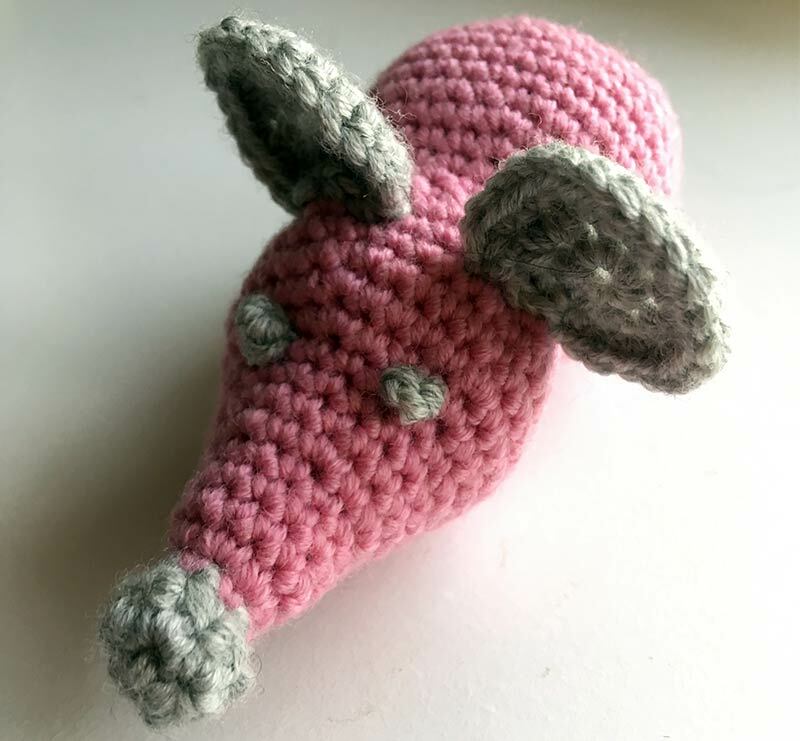 The crochet catnip mouse pattern is a nice simple one, great for beginners. If you have never crocheted before I suggest reading this basic stitches and techniques tutorial and opening this abbreviations chart in another window to help you on your way. The trickiest skill you’ll need is right at the beginning, crocheting a magic circle. You can find out how to make one nice and easily here. Despite being British, I write all of my crochet pattern in US terms. I learned using American sites and Youtube Channels, and it stuck. If you want to convert the pattern to UK crochet terms just check this handy chart. Oscar can often be found on top of my crochet. This time, I was crocheting for him. For the benefit of those readers who haven’t crocheted before, I’ll be beginning the pattern in full sentences. Introducing abbreviations individually in italics before repeating them in the main text. Here’s what you will need to crochet your own catnip mouse toy. The exact yarn I used was Patons Merino Extrafine DK yarn. But any type of double knitting yarn will do just fine. So you’ve got everything you need? Then let’s get going! 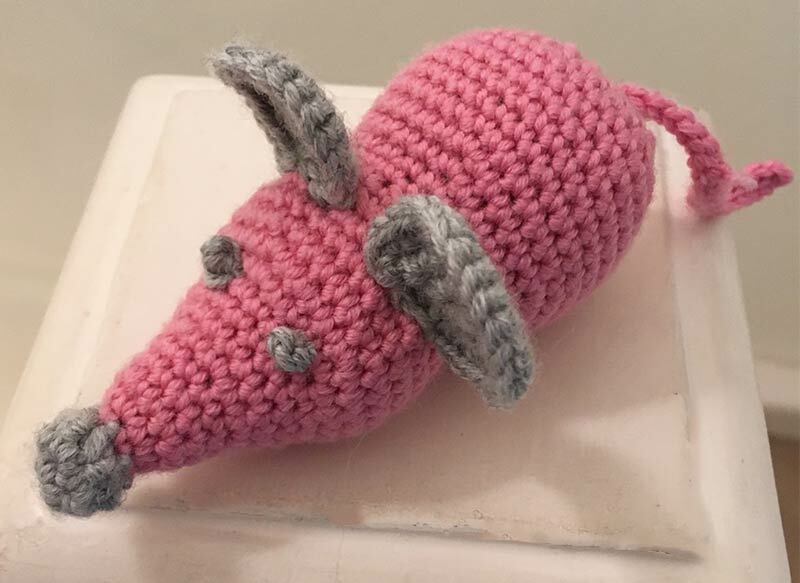 Welcome to my crochet catnip mouse pattern! We’ll be making up the head and body first, then crocheting the tail from the complete body. After that we’ll move on to making the eyes and crocheting the ears. Then we’ll sew them all together, and have a wonderful finished crochet catnip mouse toy. Simple! To make your crochet mouse head you will need to start in the 3.5mm crochet hook, using your grey yarn. Note that now you will be decreasing instead of increasing. Now take your catnip. Pick small quantities between your fingers and insert them into the mouse. Start filling the mouse with toy stuffing. Alternative a wad of stuffing with a pinch of catnip until it’s full. Make a chain of twenty stitches. Put a single crochet into the second stitch of the row. Repeat for the length of the row until you reach the base of the mouse at the end of the tail. Slip stitch and knot into the back to secure. It’s time to make your crochet mouse’s ears. You’ll construct these separately, then sew them on when they’re complete. Do the following two times using your 3.5mm crochet hook and grey yarn. Now make a single slip stitch into the next stitch, tie off and leave a long thread of yarn. To make your crochet mouse eyes you will need to cut a length of grey yarn around 11 inches long. Tie three consecutive knots in the end of the yarn. Thread your needle and insert it through the crochet mouse’s face. Weave it through near the tail, tie off and leave the end inside the mouse. Repeat at the other side of the face. To join your mouse together take your yarn needle and thread first one ear using the tail of yarn. Attach it to the top right hand side of your mouse’s head. Then do the same with the other ear at the other side. The bottom of your mouse is flat to help you tell where to place the ears and eyes. Put your catnip mouse’s eyes a few rows in front of each ear. I gave Oscar his new mouse toy at a distance. To let him notice it. At first he eyed it up suspiciously, but moments later he pounced. I’ve got to say, the photo quality rapidly went downhill due to the speed he was moving at. In fact, he played so much that the cone came off and I had to replace it! 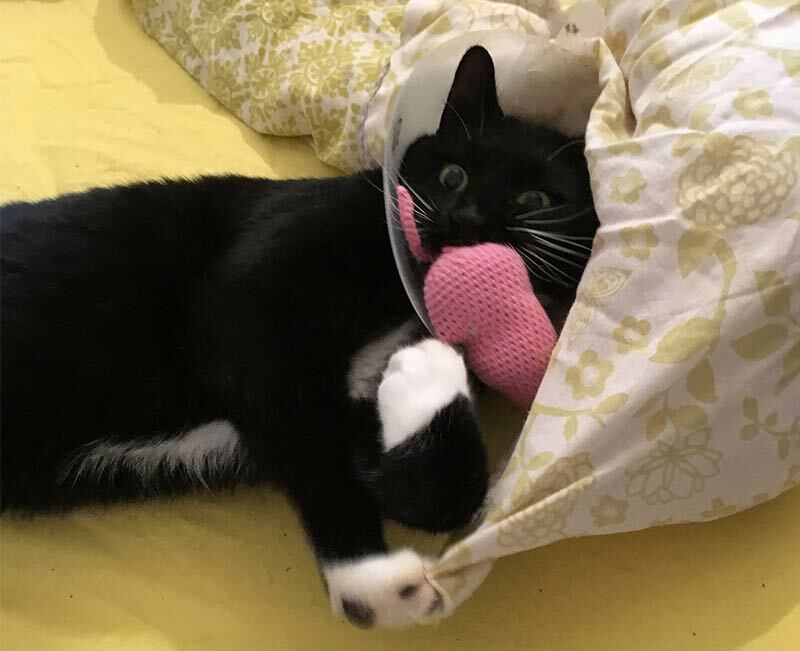 My crochet catnip mouse came to life when my cat needed an extra boost. But any kitty at any time can benefit from having some new to play and have fun with. I’m pleased to report that since I started writing this and made the pattern up, Oscar has made a full recovery. And what’s more, he still totally loves his catnip mouse. It’s looking slightly sorry for itself now, but the catnip has stayed inside and so has the stuffing. So I’m happy it will stand up to some seriously tough play. 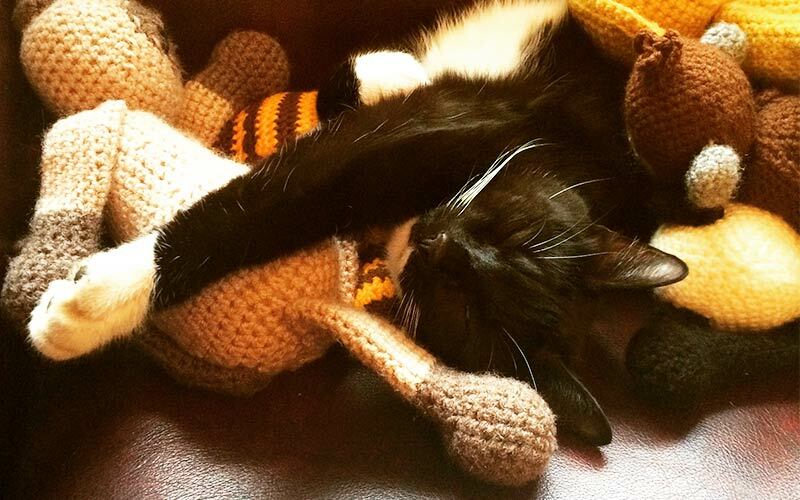 Thanks Clare for the excellent idea – I can’t wait to make more crochet catnip toys for him in future.